Sudden Industries releases Zane and the Steampunk Riders: Perfume Bandits, its first e-book in a new Wild West steampunk adventure series targeted at reluctant boy readers. “The west is big part of the American mythology, and I wanted to make sure those stories weren’t lost for younger generations. Sudden Industries today announced the release of Zane and the Steampunk Riders: Perfume Bandits, its first title in a series of western steampunk stories targeting hard to reach reluctant boy readers. The eBook, set in a Jules Verne-esque Wild West landscape, follows a band of heroic young steampunks in a fun, fast-paced and gadget-filled adventure story. Sudden Industries developed the series with writers Rick Siggelkow, co-creator of Shining Times Station and Laura MacDonald (Curse of the Narrows) after determining that the parents of young boys were having a hard time finding books that engaged their sons. 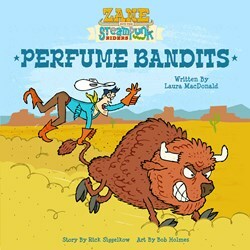 Sudden Industries, long recognized for their successful work with leading children and education brands including Nick Jr., Poptropica, Funbrain and Sparknotes, created Zane and the Steampunk Riders: Perfume Bandits to appeal to boys aged 5-8, an audience that has traditionally resisted reading. Zane and the Steampunk Riders: Perfume Bandits is based on a story developed by Rick Siggelkow, the co-creator of Shining Times Station, the hit children’s series that introduced Thomas the Tank Engine to millions of children worldwide. The eBook was written by Laura MacDonald and illustrated by Bob Holmes. It follows 10-year-old Zane, his little sister Pepper Smithereens, inventor genius Cisco, and Zane's hero, Sheriff Deputy, as they thwart the villainous Bad Bart and his evil pig sidekick, Smedley P. Blatz from robbing the noon stagecoach by using their wits and a wide variety of bizarre western steampunk gadgets. Zane and the Steampunk Riders: Perfume Bandits is available for Apple and Android eBook readers as well as Amazon’s Kindle. For more information about Perfume Bandits and other products featuring Zane and the Steampunk Riders, visit http://www.steampunkriders.com. About Sudden: Sudden Industries has spent the last 17 years helping large entertainment and media brands tell their digital stories. As digital storytellers, Sudden is platform agnostic, providing award-winning solutions for web, mobile, games, animation, print and television. Based out of New York City, Sudden has provided strategic, creative and technology solutions for a wide variety of brands including Nickelodeon, Poptropica, Funbrain, MTV, VH1, Comedy Central, Spike TV, Sparknotes, Barnes & Noble and NBC Universal. For more information, please visit http://www.suddenindustries.com.